Arrow’s Cloud Video Conferencing extends high-quality video conferencing to meeting rooms, computers, tablets and mobile phones so that everyone can participate. Wherever they are. 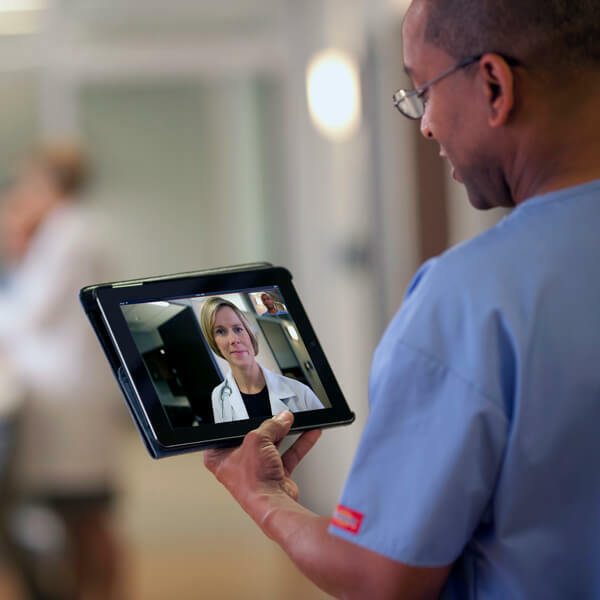 Meet and Connect from anywhere with our HD video conferencing solution. Everyone can participate, from multiple offices, from home or on the road. Arrow’s Cloud Video Platform is built on the award winning software Vidyo and uses secure UK data centres ensuring a high level of reliability and security for your video calls. Arrow’s Cloud Video Platform is always kept up to date and will support your organisation now and going into the future. Whether on desktop, tablet, phone or in a dedicated room system the underlying software, Vidyo will provide you with the best possible experience. Utilising scalable video coding we can enable calls from 4K to simply supporting audio. Vidyo is an award winning software company whose vision is to connect the world by video-enabling any application or idea. Vidyo delivers the highest quality video conferencing service for market leaders and innovative start up businesses alike. Our cloud service is built by utilising this award winning technology and we deliver it from secure UK data centres with built in resiliency ensuring that your ability to collaborate is never disrupted and always private. Our Cloud Video Service offers video conferencing accessible from your desktop, tablet or mobile phone over any Wi-Fi or data connection. Your system is also able to connect with any other video conferencing room system over IP. Whether you are looking to launch your own app with built in video chat or whether you have a contact centre and are looking to build in a video stream with skills based routing, we have the solution for you. Vidyo has a full suite of API’s built into it’s Vidyo.IO or Vidyo Engage platform making it easy for your developers or ours. With Vidyo you will ensure that your product not only goes live quickly but is sustainable and free of bugs. of engineers, striving to make your video service consistent and reliable. We have created a number of deployment solutions to fit any business. Whatever your requirements, we can provide a solution that will enable you to increase productivity, save money on travel costs and engage with more people using video conferencing. Create a Connected Workforce with our industry-leading platform. Performance at the highest end of the quality spectrum. We use world-leading suppliers of AV & VC equipment. Arrow works with best of breed suppliers and will work closely with you to ensure you receive unbiased advice and the best technology for your requirements. Polycom is a world renowned manufacturer of video conferencing hardware and software. Polycom is a stable, reliable and easy to integrate system that will suit all your video conferencing needs. It’s array of hardware is available to fulfil any size room and any need. From the RealPresence Group Series to the Immersive Rooms, Arrow has the experience needed to make sure you have a successful installation. Polycom has gone above and beyond to create a superior user experience and to ensure that no matter whether you are in a dedicated meeting room, at home or on the go that their hardware and software will support your workforce. Whether you are an existing Polycom user or looking into their technology due to their market pedigree we can support your expansion or the very start of your journey. Skype is becoming more and more prevalent in the business arena. With the inclusion in most Microsoft Office packages the question is how to utilise Skype in-room scenarios and what level of Skype licensing you need for your business. As Arrow is a Microsoft Gold Partner we can assist on every level of your Office 365 journey from installation to integration and maintenance. Arrow has the experience and knowledge to help you make these decisions. With a suite of products that integrate with Skype such as Polycom, Lenovo, C-Touch and many more, you can make the most out of your existing or future purchase. We use world-leading suppliers of AV Equipment. Whatever your requirements, we are confident we can provide a solution that will enable you to increase productivity and engage with more people using video conferencing.